For many years, off and on, I had prayed to God for a mentor, someone older and wiser than I. But God never seemed to answer that request. And then someone I knew for 30 years died unexpectedly. Dr. Hoeh's death was an emotional jolt to me. It was upon this man's death I finally realized that God had answered my prayer for a mentor, but not in the way that I had recognized. God had, indeed, provided me with a mentor of inestimable spiritual value. Herman L. Hoeh died on Sunday, Nov. 21, 2004. He had served the Church of God for more than 52 years. You can read some of the details in the thoughtful edition of WCG Today [formerly The Worldwide News] with Dr. Hoeh's photograph on the cover. When I reflected upon his death, my mind was flooded with a powerful, overwhelming understanding that Dr. Hoeh was a tremendous spiritual success. He was successful in all those ways that really matter in this physical life. Primarily, he was a servant to all. Secondarily, he was a peacemaker. He was a servant and peacemaker consistently, faithfully and from the heart for those 52 years. May I recommend Victor Kubik's Web site ( www.kubik.org). It has dozens of messages about Dr. Hoeh's service through the years from a full spectrum of individuals: within the Church of God and those who never were associated with the Churches of God. Those letters share specific, important examples of how Dr. Hoeh served all. You will learn important lessons on how righteous behavior was applied to practical daily living by Dr. Hoeh. As for me, there is one important lesson he left with me that I now share with you. One evening Dr. Hoeh and I were discussing various topics that led me to ask: "Dr. Hoeh, how can I best serve in the church?" He paused and then gave me a simple three-word reply: "Quality of thought." Through our many discussions he would lead me in the process of analyzing God's Word and how to achieve carefully, well-thought-out conclusions. He understood that "quality of thought" was foundational to righteous living. ". . . Although I had talked briefly with Dr. Hoeh many times as an AC student in the 1970s, I had never spent any real time with him until I was sent over to his Hall of Administration office in the fall of 1979. "Dr. Hoeh was on the phone when I arrived, and he motioned that he would just be a moment. I took the time to examine the many shelves of books he had. I was struck by the fact that he had the entire collection of the Hardy Boys and Nancy Drew series. I asked him about it, thinking that they were intended to be donated. "He replied that they were his, to my great surprise. His explanation? "The ability to read is a gift. What we place into our minds by using this gift must be selected with care, as everything we read influences us. "Those books are simple but satisfying for a tired mind desiring entertainment. They always end with justice being served. "In my view, they represent a suitable alternative to the rubbish that many unfortunately prefer." In conclusion: Yes, Dr. Hoeh knew that having quality of thought required guarding the door of one's mind. Guarding it does not mean slamming it shut. To guard the door of one's mind means to carefully evaluate the soundness of ideas before adopting them as one's own. "For though we walk in the flesh, we do not war according to the flesh. For the weapons of our warfare are not carnal but mighty in God: [Why?] For pulling down strongholds. "[For] casting down arguments and every thing that exalts itself against the knowledge of God. Bringing every thought into captivity to the obedience of Christ . . ."
Thus, if you want to live a successful spiritual life and serve the Church of God in a very valuable manner, you can do so by having quality of thought. Name and location withheld. 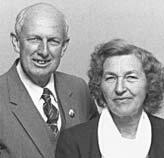 Dr. and Mrs. Hoeh in 1996, when he retired from active duty in the church and college. CLYDE, N.C.--I will miss my friend Herman L. Hoeh, Th.D., Ed.D., author, editor, educator, historian and theologian extraordinaire. He was my colleague and mentor from my Ambassador undergraduate days some four decades past. A scholarly gadfly, Dr. Hoeh remained insistent on fact and truth, and he dedicated his life in the service of others, exemplified in his efforts to improve the condition of human life for all peoples and cultures, particularly the people of Thailand, and his work in IIMAS (the International Institute for Mesopotamian Area Studies). His character, commitment and courage are high standards for educated men and women to emulate. He held that "the Word of God is the foundation of knowledge" and lived accordingly. Would that we should live so. Michael P. Germano. CLYDE, N.C.--I received a letter several days after Dr. Hoeh's death. The issue that he and I had been discussing was the change from the Old Cycle Calendar (the priestly calculated calendar of Jesus' day) to the New Cycle Calendar (Hillel II calculated calendar). It was Herman's and my conclusion that the Torah forbids Pentecost from occurring in the summer (after the summer solstice), and therefore there had to be a cycle change no later than A.D. 256. There was probably an earlier cycle change from the Patriarchal Cycle to the Old Cycle Calendar as well. All this presumes that the Israelite priests, or the patriarchs themselves, knew enough astronomy to develop a rule-based mathematical model, which we simply call a calculated calendar. There are ways of testing this theory, and I have been in the process of doing so. My opinion is that the Karaite calendar, the observed calendar and the so-called biblical calendar (Passover is on the first full moon after the vernal equinox) are fallacious. Michael P. Germano. Now that you have the background of my earlier conclusion regarding the Hebrew Calendar, I must immediately answer you. The Church of God fellowship correctly reevaluated the counting of Pentecost in the year 1973/74. It also corrected the error of excluding the 14th of Nisan (and year "0" therefore) when occurring on a weekly Sabbath. Hence we can correctly translate Luke as "second/first" sabbath literally (Luke 6:1) for the year A.D. 29. Thus there is no requirement for A.D. 142 or 161. The controversy among Jews after 135 was centered on where authority lay--in Tiberias, the Galilee, or in Babylonia. (Hence the two Talmuds.) It was settled in favor of Babylonia. The question of the spring equinox was not the issue in the second. The first absolute evidence of the new earliness of Passover occurred in the mid 3rd century, i.e. A.D. 256, which was the 7th year of the older cycle. At this point the Jews judged, not from the correct day of the wavesheaf, but on the old basis of the Sadducees, who controlled the priesthood. By that reckoning the day of Pentecost, as the ancient priests in the time of the Sadducees judged it, would have fallen on the first day of summer. It was a judgmental error and Anatolius comments on it clearly (see Ante-Nicene Fathers). This controversy set the Church aflame, and thereafter the annual festivals gradually fell into disuse among the Christians in general. I personally suspect this decision of the Jews was yet another step to keep Christians away from fellowship with Jews who did not enforce the cursing of Christ's name, which originated in the close of the 1st Roman war in A.D. 70. Further, this decision led to the Jews wrestling with Passover as too early and hence postponing an intercalary month. This continued up to the beginning of the Ninth Century (A.D. or C.E. ), but gave the lesser Beth Din (of 3) power over the Calendar versus the claims of the Karaites of Post-Temple times. Of course, the need for a postponement at some period arises from the Hebrew 19-year cycle being too long by one day in 216 years. Hence I withdraw any statements not in keeping with the decisions of 1973/4, with which I concurred. Do you know who posted the article you sent me? If you don't know, don't search! By the way, the Temple commenced with groundbreaking in 968. And the reigns of Judah's kings began with accession year reckoning in 931, the spring. Professor Frank Cross's research confirms this needed correction. I could send you more on OT chronology if useful. LONEDELL, Mo.--I was a transfer science student from the University of California in Berkeley, Calif., and attended Ambassador College in Pasadena in the early '60s. Dr. Hoeh was the only minister I ever chose to counsel with. I suppose I always knew he didn't think like the other ministers, who fit into an expected mold. It was hard for me to be at Ambassador since I was not a ministerial type. I could identify with Dr. Hoeh. An early example was when I did a research project for him on geologic strata in certain areas of the world. I went to the UCLA library that day for Dr. Hoeh. He told me to phone him when I got back so we could discuss what I'd learned. I came back with charts and notes. When I phoned, I asked him where we could get together. I assumed we'd go to the library, but he said he'd come right over to my dormitory. We sat on the dormitory couch and went over the research. It was a shock to me that he'd come to a student dorm. Other students walking past us in that room had surprised expressions. There seemed to be an unwritten code that ministers did not come to your level. Ministers were not to be just like one of you or come to a dorm. Dr. Hoeh rejected those rules of caste. He would walk across campus and pick up pieces of paper off the ground and take them to a trash can. Again, ministers didn't do that kind of thing. He must not have thought of himself more highly than he ought to have thought. As I age, it becomes more meaningful to me to restore contacts with people who played a significant part in my past. I hadn't seen or talked to Herman Hoeh in 30 years. I got his phone number and called him last year. Many people think of Dr. Hoeh in terms of being a minister, but I don't. I think of him in terms of being a history researcher; a person interested in archaeology; one who seeks out new knowledge and tries to develop it. Our phone conversation loosened up when I diverted the discussion from religion to archaeology. Also, I asked if he still did research for historical societies. He said he did and became very enthusiastic about an archaeological project in Syria. He said he'd been there three times since his "retirement" from the WCG. He'd made friends there and saw some of the needs of the people. When he came back to the United States, he found a program to help needy people in other countries. He went to Oklahoma, purchased farm equipment and had it sent to this area of Syria. On a later trip for this archaeology project he said he was walking down a street in a town in Syria and he heard a man yell out from a second-story window, "Dr. Herman!" Others in the area then recognized him and came over to talk. His works had influenced them. I asked "Dr. Herman" how he spends his days. He said he and his wife drove around an older woman who lived near him. She couldn't drive so they filled that need. I know of one man who sometimes attended the same congregation as Dr. Hoeh who said Dr. and Mrs. Hoeh and this woman often ate lunch after church in his older car. They brown-bagged their own lunches. His actions show he was a true minister after all. Dr. Hoeh had always been different. The day will come for all of us when the silver cord is severed, the golden bowl is broken, the pitcher is shattered at the spring, and the night comes when we can no longer work. Yet our influence may remain. God knows who we are and will once again have a desire for the work of His hands. Bill Stough. EUGENE, Ore.--My wife and I were saddened to learn of the death of Herman L. Hoeh. We enrolled in Ambassador College in 1953 and "Mr." Hoeh was our English teacher. Mr. Hoeh had an uncanny knack of knowing what you, as a student, did not know, and that is usually what he tested you on. Most of us in that class were "boneheads" and needed all that he could teach us. And four students took the class for college credit, not because they really needed it. For the final exam he devised two tests. We boneheads got the regular test, but the four sharp ones got a different test. Inside the hardback cover of the English book were a few technical points about English that are never used in written or spoken English. Thus no one paid any attention to this back cover--except Herman Hoeh. He used that to test the four "brains" in the class, and they all failed the test. In my first Bible class under Mr. Hoeh it came time for final exams (in college a two-hour period was set aside for the finals). He spent the first hour and a half merely talking in general terms, so we students began to think we were going to escape getting a final exam. Obviously we had not at that point learned too much about Herman Hoeh. With 30 minutes to go, he stepped to the blackboard and wrote in large letters: "I BELIEVE IN ___. IF NOT, WHY NOT!" He let us stare for a few moments at the blank he had drawn and then wrote in large letters in the blank: "TRANSUBSTANTIATION." He then announced, "You can have full use of the library," which meant only 30 minutes to do the research and then write the paper. Bear in mind that we had not studied that word or that teaching. The classroom emptied except for three of us. The mere fact that I had taken an etymology class saved me since I had never heard of the word. Using what I had learned about etymology enabled me to break the word down and figure out its meaning. "Trans" and "substance" enabled me to figure out that this word meant the transforming of a substance. I was barely acquainted with the Catholic teaching that in "Communion" the wine and the bread are transformed into the literal blood and body of Christ. The point I used to prove that this was a false teaching was God's prohibition against eating or drinking blood. Thus the wine could not become literal blood. From then on we knew that there was absolutely no way we could figure out what he would test us on during finals. For example, in world-history class he gave us a full two-week review of all we had covered in class and even allowed us to tape-record those sessions. As a result, there was not a single question he could have asked on those things covered in the review that I could not have answered. But guess what. On the final he did not ask a single question on any subject we had reviewed. His expressed reasoning: "There is no reason to test you on what you already know." Over the past 50 years I have searched my brain trying to remember how I got commandeered into teaching Herman Hoeh to drive a car. That's right! He could not drive a car until he was both an evangelist and an instructor at Ambassador College. All I can recall is that I found myself teaching him to drive. I believe all who knew him will agree he had a brilliant mind. However, that brilliant mind did not always extend to physical dexterity, especially when it came to driving a car in the Los Angeles area. I look back today and wonder how I survived. Mr. Hoeh often drew the assignment to visit one of several outlying congregations in Southern California on the Sabbath. I was often paired with him as the giver of the sermonette; he would deliver the sermon. On one of these trips (to San Diego) Mr. Hoeh's wife, Isabell, was eight months' pregnant with their first child, Karline. The car assigned to us for that trip was a 1951 Chrysler Imperial that Mr. Armstrong had donated to the college when he bought a new car. It was my job on Friday afternoon to take the assigned car out for servicing for the scheduled trip. That was the year, 1951, that Chrysler introduced power brakes on its various models. Since power brakes were new, they were not yet perfect; they were extremely sensitive. The next morning, when Mr. Hoeh was getting behind the wheel, I strongly suggested he make the opportunity to test the braking process before he had to use the brakes. For some reason he chose not to test the brakes. This was in 1954 and the Santa Ana Freeway had not been built and we had to travel on Highway 101. Somehow we got all the way from Pasadena to Santa Ana before he had to brake. We were traveling about 60 miles per hour, and up ahead was a traffic signal. Since the signal was on the open highway where traffic usually traveled at least 60, the yellow light was a rather long one. I would guess we were 200 yards from the signal when the yellow came on. In the back seat were Mr. and Mrs. Elmer Woody and I.
Mr. Hoeh did not merely brake in the common sense of the word when the light turned yellow. He jammed on the brakes. The car skidded to a halt with all four wheels locked. The eight-months'-pregnant Mrs. Hoeh was slammed under the dashboard. (Those were the days before seat belts). Claudine Woody was sitting between her husband (whom we called Woody) and me. Woody and I were both experienced drivers, and when we saw the light change we both tensed our legs against the floorboard so, without even thinking, we were ready for the stop even though we had not expected it to be so abrupt. Claudine became airborne. Woody and I grabbed her around the waist as she hurdled over the back of the front seat and headed for the windshield. All Mr. Hoeh said when the car came to its abrupt halt was (with his well-known snicker of a laugh), "I see what you mean about the brakes." Though she said nothing at the moment, I do not believe Mrs. Hoeh found the matter amusing. At another time we were returning from San Bernardino on a Sabbath. We were traveling on Rosemead Boulevard through the city of Monrovia. At this point the road was two lanes in each direction. As we approached the northern edge of the city, the road narrowed to one lane each direction, with adequate road signs warning that the right lane was ending. We were traveling about 45 miles per hour where the right traffic lane ended and where street parking was allowed. I was in the right front (suicide) seat as we drove along in the right lane. Looking ahead, I clearly saw a parked car where our lane would have been had the lane not ended to allow street parking. Because of my driving experiences I had learned to watch for all potentials as we drove along. I waited and waited for Mr. Hoeh to move to the left for the only lane available to us just ahead. At 45 miles an hour we were quickly narrowing the gap between us and the parked car. Keep in mind that I was a mere student attempting to teach a college instructor and evangelist how to drive. This student did not feel at liberty to make demands on the driver. But at the last moment I yelled, "Mr. Hoeh, you have got to get over!" He swerved just in time so that the only contact was a glancing blow as the big wraparound bumpers loudly banged against the parked car. We never stopped. Mr. Hoeh, still driving at 45 miles an hour, said to me, "I don't see any damage. Do you?" Since I was in our car, I could not see any damage to our bumper, and since the other car was now a quarter of a mile behind us I could see no damage to it either, so I answered "No, I do not see any damage." I was privileged to have shared interesting experiences with Dr. Hoeh and others such as Ted Armstrong, Rod Meredith, Raymond McNair and Jack Elliott (dean of students). For example, Raymond McNair--who was already an evangelist--would look me up when he came in from the field ministry and take me to a secluded place on campus where we could not be observed so we could "rassle" Arkansas style, since we were both from Arkansas. Arkansas rules allowed gouging, biting and pinching. Also, I hunted, camped, fished and hiked with Ted. One time several of us ended up at Ted's home to play poker. Ted kept a jar of pinto beans for use as poker chips. To this day I can hear an echo in my ears of the familiar sound of Ted's laugh when the final hand was played and I (the novice) had all the pinto beans. I share these stories to show the human side of people we held in rather high esteem. Some of us were privileged to see not only the brilliance and talents of these men but that they were human too, with their own deficiencies and frailties. It is the trivial things we share in life with others that create lasting fond memories. What an event-filled and interesting life mine has been. Bill Glover, Box 2784, Eugene, Ore. 97402, U.S.A.; billgloverlgm@msn.com. KILGORE, Texas--During my first year at AC Pasadena (1968-69), the second-year Bible class took the annual field trip to Shark's Tooth Mountain in the High Desert area east of Los Angeles. Dr. Hoeh sat in the back seat of the bus, surrounded by young students, regaling us with stories of his archeological trips around the world. He also described the geological features we could see out the windows of the bus. Here he was, a senior evangelist, in his shirtsleeves and boots, entertaining his students. He was a man full of life and energy. My second year at AC Pasadena found me in Dr. Hoeh's Classical Literature class. In the second semester we studied Josephus and several other historians and philosophers. In the last class period we asked him what would be on the final exam. His reply: "Concentrate on the general outline and concepts of Josephus." The day and time of the final arrives, but no Dr. Hoeh. He rushes in, out of breath, 20 minutes late. "I forgot about your final, so I had to run by the office and grab one from years past. Here it is. Get busy." Much to our shock, the first page is 20 fill-in-the-blank questions. A couple of hours later I am walking along Grove Street and run into Dr. Hoeh. He stops me and asks what I thought of the exam. My reply: "It's kind of hard to be general on a fill-in-the-blank." He tells me not to worry for I have done well in the class. I receive an A for the course. In the spring of 1970 Dr. Hoeh invited my fiancee and me over to his home storage area to pick out some wedding gifts for the forthcoming wedding. He had a couple dozen tables covered with items he had purchased in garage and estate sales over the past decade: silver, crystal, china, works of art. He told us to pick out two or three as wedding gifts. We did so, and his comment was "My, my, you do have good taste." When we turned the items over, the prices he had paid were still attached. I gave him a look and he commented, "It helps you appreciate them all the more." I still have the items after all these years. Many years later I heard from Jim Gillen that Jim had once mentioned to Dr. Hoeh that he, Jim, had found a place in the valley that had apricots for a quarter a pound and had bought 10 or 15 pounds. Dr. Hoeh got directions from Jim and said he would check it out. The next week Jim asked Dr. Hoeh if he had gotten any apricots. "Sure did," he said; "250 pounds, and they are drying in the backyard right now." The man knew a bargain when he saw one. I will never forget Dr. Hoeh's sitting on the front row at Bible study in the gym on the Pasadena campus on Friday evenings reading a book, looking totally uninvolved in what Mr. Armstrong was saying. But, whenever Mr. Armstrong would stop and ask Dr. Hoeh a question, there was no doubt he had been paying close attention to both the book and his boss. He was a fine example of multitasking if I ever saw one. I have followed his example and now do the same in meetings at Kilgore College. Needless to say, Herman Hoeh was one of my favorite people in Pasadena. He was The Universal Man if ever there was one in the WCG. Sorry to see him die at such a young age. I cannot believe he was only 13 years older than I am. Michael Kusheba. TYLER, Texas--Herman Hoeh was one of my "most unforgettable characters." He certainly was one of a kind. He always brought a book to church and managed to appear to read it all through my sermon. Yet, when services were over, he always had something to say about the content of the sermon. He apparently had mastered the art of polyphasic thinking. But he was also a man who did not esteem himself more highly than he ought. After Ambassador Club meetings he could commonly be seen helping the guys put away the tables. When he came into the room, he chose the least seat. And one day, when I was working hard to load a dump truck with dusty, broken concrete forms, he came by and helped me load my truck. A humble man, I think. And one who tried to help students in any way he could. I pray God will comfort Isabell and the children in their loss. Ronald L. Dart.